As all know that I was visiting Canada recently, for about six week’s program. By Allah’s grace, this tour was successful by all measures, in respect of programs with the Jama’at as well as with others. After Canada’s Jalsa Salana, in the next sermon there, I had already related people’s expressions, administrative matters and thankfulness for Allah’s blessings, regarding Jalsa. Today I will talk a little about the other activities and programs. By Allah’s benison, like many other Jama’ats, Canadian Jama’at is among the Jama’ats that stride forward in faithfulness and devotion. By Grace of Allah, young boys as well as girls possess the spirit to move ahead to participate in Jama’at work. Particularly, regarding media and press, the young people have worked a lot. They strived at a large scale for introduction and God has made their efforts fruitful. They have increased the existing introduction and good relationship with politicians and government functionaries. But, this time, a distinct difference was visible in media relations. But, in reality, it is purely a blessing from Allah the Exalted. They only tried but Allah blessed immensely. These youngsters, these workers, themselves admit that the response that they received exceeded their expectations by great measures. We tried in the past to be mentioned or to get a news item in the press, so that the Jama’at and Islam is introduced but the media very was reluctant. By contrast, this time, the media was following us to give them time to talk to and interview the Imam of Ahmadiyya Jama’at. Due to the paucity of time, we approached the media as much as possible and had interviews with some and had to apologize to the others. Now, the media team that we have, should reach out to them and apologize personally as well as in writing and keep in touch with them. This is important for future connections. Anyway, I present some impressions of different functions. By the grace of Allah, three new mosques have been built but only two had functions where others were invited. A function was held in the parliament. I spoke at York University function. Symposia were held in Toronto and Calgary, where, I got a chance to present Islamic teachings to others. Due to Allah’s blessing, everywhere, the people acknowledged the beauty of the Islamic teachings. First of all, I will briefly talk about the media coverage in Toronto. University will be mentioned later. There were three interviews in addition to other business. One interview was that of a famous network ‘Global News’ of Toronto. It was watched by three hundred thousand people and one hundred thousand watched its report on line. The second interview was conducted by Peter Mansbridge, a famous journalist and chief correspondent of CBC. It was conducted earlier but broadcast two weeks later. It was a half an hour program shown on national TV. As I said it was conducted by the most senior journalist who is considered very important. It was about Islam, about world affairs, about the advent of Hazrat Promised Messiah (may peace be on him), and there was a lot of discussion about the extremists who have brought bad name to Islam. They published a part of it and skipped some parts. However, there was a large coverage. Similar was the one by a national newspaper, Globe and Mail. The one that I mentioned earlier, the interview by CBC, was watched by ten million Canadian people according to their estimates. And then, through the newspaper that published detailed news and published on YOU Tube as well, the news reached more than a million people additionally. Then news with reference to the lecture in the university was published by the newspapers and periodicals and its coverage reached about five hundred thousand people. Now I will talk about the next program that was the first one after the Jalsa. It was in the parliament, in Ottawa, their Capital. There were different activities and the program lasted almost the whole day and I met several people. There was a separate meeting with the Prime Minister. There was a meeting with some of his ministers as well, in a cordial atmosphere and I thanked them for their cooperation with the Jama’at that has always been there. A session was held in a hall of the parliament. It was attended by six ministers, fifty-seven National MPs, eleven ambassadors from different countries, first secretary of the US embassy and representatives from the Libyan embassy, and ministers from the Ontario Province. Over thirty dignitaries, Chief of Staff and ministers were attending. Then, the following were also included: a director of Evangelical Fellowship, Chief Communications Officer of the Canadian Red Cross, Assistant Commissioner of the RCMP, professors of University of Ottawa and Carleton University, some Vice Presidents and Deans, Director of Canadian Council for Muslims, representatives of US govt. and certain Think Tank members. So, there was a gathering of those people who consider themselves to be at the helms of the world affairs. I had a chance of presenting in the light of the teachings of Islam. Similarly, I made clear the character and duplicity shown by those people and that they should not blame only Muslims. They need to look at their own deeds. Certain disturbances were created by them in the world. Anyway, I present the impressions thereafter. Judy Segro, an MP, said that the address of the Imam Jama’at was full of pieces of advice on how we can escape the third world war. It was evident that we need to work hard and cooperate with each other to save ourselves from that disaster. She further said that the given message needs to be spread around the world. An MP, Kevin Waugh, said that (the Imam) shed light on many topics in a few words. He further said that he was impressed particularly by the matter that the Imam Jama’at presented many quotes from The Holy Quran in his address. This was especially a pleasure for the people like him who have very little knowledge of religion. This increased his knowledge as well. All picked points and opined according to their thinking. Israeli ambassador was also there and said, “It was an important message of peace about how all religions should respect one another.” He said, “That day my thinking changed about Islam and, its appreciation has increased. The address should be published and spread to more people. If the people follow that message, the world’s deep and serious problems can be solved.” He further said that he liked very much, the angle of “tolerance” in the address and that the rights of all the people be given irrespective of whether they are Muslims or Jews. Then, Louise Arbour, the senior immigration judge and the recipient of this year’s Sir Zafar Ullah Khan Eward, expressed her thoughts and said that Imam Jama’at, in clear words, pointed to our shortcomings and weaknesses and shed light on the problems of the western society and that they sometimes show hypocrisy in their actions and they don’t give rights to the minorities. Then, a guest, Garnet Janus says, “The message was quite agreeable that how religion and religious leaders can solve the problems of this age and establish peace in the society.” He also highlighted the matter that how we can live together in peace by controlling the trading of arms. He added, “Generally, we blame each other, but Imam Jama’at explained that how the west and the other countries can improve the world situation by playing their own parts by themselves. A Sikh guest said, “(Imam) said in the parliament that the west is also responsible for the unrest in the world. For example, he cast light on the matter that how the terrorists lay their hands on arms sold by the western countries. (He) made it clear that 20% of the Canadians who go for terrorism are women and they will tinge the next generations in the same color.” He said that he never thought about that. He further said, “I liked it much that he (Imam) referred to the holy Quran while saying that we need to need to fulfill our covenants and deliver our trusts and told in a delightful way that Governing is also a trust and government officials should amicably deliver their trusts. Imam Jama’at has also said that the religious scholars have misled the people and the disorder is increasing for that reason. (he) has also challenged the western countries that they claim to establish the freedom of conscience and freedom of rights. Now, it is their responsibility to put their claims to practice and should not interfere in religious matters like ban on hijab and places of worship.” He said that the west has been reminded very well. Another guest, Drake Kennedy, whose sister accepted Islam recently, says, “I came here with my sister today because she accepted Islam lately and we wanted to know what the teachings of Jama’at Ahmadiyya are. My joy knew no bounds after listening to the address of the Imam Jama’at and that my sister has joined the people who are loving, caring and considerate. I am very happy about the things that I learned today.” In the same symposium, I had mentioned the services rendered by the Jama’at for peace in the world. Similarly, present in the parliament, this person, president of the Nile Association, Muhammad Alwahaji said,” Today’s message was very clear that all of us should live with love and we don’t need to hate anybody. The peace cannot be established If we keep on hating each other.” He says, “when I listened to the Imam Jama’at’s address, I could not believe that a Muslim leader can address in the parliament in that manner. There was no shade of doubt, and he spoke so fearlessly that people were convinced that that was the true and accurate message of Islam. There are some people behind the wars that are being fought and they are profiting from that.” He further said that today also, I spoke with reference to ‘love for all and hatred for none’ and that must be our line of action and that was the truth. Then, we went to Saskatoon. Some press conferences were held and there were programs of the Jama’at. There was no program with others, but through press and radio, the message reached a total of 1.8 million people. Then, there was the opening ceremony of Masjid Mahmood, Regina. There as well, after the Friday prayers, there was a reception in a hotel in the evening, regarding the mosque. 200 guests joined there. The Chief minister and Deputy Chief minister of Saskatchewan province, mayor of Regina city, minister of public safety, Deputy House leader, current and ex mayors of surrounding areas, President and Vice-President of the Saskatchewan university, Head of the Religious Studies Department of the University of Regina, professors, priests, police chief and the guests belonging to different walks of life participated. Then, the leader of opposition of Saskatchewan, Trent Weathersopoon says, “Today’s gathering was beautiful. Imam Jama’at’s message was important and powerful in which the commonalities were pointed to. We were told that Canadian Ahmadis favor the belief to prefer humanity. Imam Jama’at Ahmadiyya’s message that we should like for others what we like for ourselves, is significant for all of us.” Then he says that the message was the establishment of mutual tolerance and peace. Imam Jama’at pointed to the values that we all should act upon. These values are to strengthen not only our city Regina or our province Saskatchewan but are also for our country and the whole world. After the opening ceremony and reception, media coverage was due to the press conference with different newspapers. There were individual interviews and there were about six or seven media people from TV, radio and newspapers. Due to the opening ceremony of the mosque in Regina and the press conference thereof, the massage of Islam reached about 1.97 million people. Similarly, Masjid Baitul Amaan, Lloyd Minister was inaugurated after Regina. It is a small place and mostly the oil traders go there. 49 non-Jama’at guests attended the reception there. A member of the Saskatchewan legislative Assembly, former members of the Legislative Assembly, former MPS, newly elected mayors, mayors and deputy mayors of surrounding areas, councilors, professors, teachers, journalists and people belonging to different walks of life were among the attendees. Former minister for immigration and defense, Jason Kenny (he has old relations with the Jama’at and has personal relations with me) was also present there. He said, “Jama’at Ahmadiyya is a small community but is all out to work and is showing the shining face of Islam. In the wake of the state of world affairs today and the wrong notions about the extremism that Islam allows extremism, Jama’at Ahmadiyya is an antidote. This is the Islam that is exactly in conformity with the Canadian civilization. 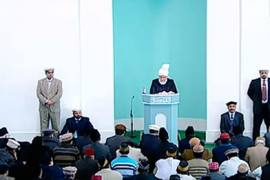 It is a guarantee for peace.” He says that inauguration of the mosque and the visit of the Imam Jama’at Ahmadiyya will be a source of increasing knowledge. And, the beautiful face of Islam will be presented to the people. Then he says, “In today’s speech, the Imam Jama’at refuted all the negative thoughts that could emanate in the minds of the people about Islam. The inauguration of the mosque is a positive step and truly conforms to our values.” He was the first minister who called me to condole the martyrdoms of the Darulzikr and Model Town, Lahore; and promised to populate the families of the martyrs in Canada, and fulfilled the promise also. By the grace of Allah, all the families of the martyrs have gone there. After that, I went to Calgary. There, the Jama’at is big, the city is big, and our mosque is very big and beautiful. There was a symposium there on 11th Nov. after Friday prayers. About 644 guests attended. Among the guests were the former prime minister of Canada, Alberta’s minister for human services, former and current mayors of Calgary, former minister Jason Kenny, Dean and Vice-Chancellor of the University of Calgary, mayors and deputy mayors of certain nearby areas, President of Red Deer College, members of legislative Assembly and people from different departments. It was a good gathering of over 600 well educated people. Brian Litoschief expresses his thoughts, “Imam Jama’at kept the address focused on peace. It was a great approach. I knew very little about Islam, and was afraid. I was confused due to the negative coverage of the media. I used to think that does the Quran really teach mischief. After all, today, I have got answer to my questions. The Imam Jama’at has presented the qur’anic references and proved that Islam is a religion of peace. Before, whenever I would meet a person belonging to middle east, during travel, I was afraid that that terrorist may not attack, but I came to know today that there is no need to be afraid of the Islamic teaching. We very much need the message given to us by the Imam Jama’at because disorder has been created in the world and Imam Jama’at has told us that we have to fight the hate with love and sympathy”. Then Calay, a lady, says, “I could never think how important was the program I was going to attend. I came only to please a friend of mine who had invited me and impressed upon me to join it. (She is also a well-educated lady) But I am very happy that I came here. I have never seen such a program where there is positive thinking everywhere. The message of the Imam Jama’at is supreme. A less knowledgeable person like me has also understood it very well that Islam is such a religion that welcomes every community, race and religion. So, we need not be afraid of Islam. What we need is to try to better understand the Muslims.” I had presented some references of orientalists like Stanley Moore that were about The Holy Prophet (peace may be upon him) that how he established peace and how was (his) tolerance then. She says in that context, “I am very pleased with the references of the non-Muslims and the way they have presented their point of view and proved that the Prophet of Islam (may peace be on him) was peace-loving.” They bring people to the function just like that, but the Ahmadis should also brief their acquaintances about the beautiful teaching of Islam. Then, the avenues of Tabligh open slowly in that way with conversations. Not that you talk a lot about worldly matters and there is no knowledge of Islam. She thought about her old friend to attend the function for her sake, but the Ahmadi friend had never told her about Islam. Our young boys and girls should pay attention to this. A police officer of Calgary Police said, “the address was very interesting. Imam Jama’at told how Islam promotes multi-culturism”. He says further, “Our society needs it very much. Imam Jama’at is bringing all the people together and pushing the interfaith dialogue. Imam Jama’at’s discourse has touched my heart especially when he talked with reference to world relations and told us how the solution to the problems can be found. He proved with references from the Holy Quran that Islam is a religion of peace and Muslims have been instructed to go for peace under all circumstances even if the other party has ill intentions.” Anila De Juan, a guest, says, “I liked it that Imam Jama’at, told the western world, in the presence of the Prime Minister that they should do the justice and think about their conduct in the problems of the world. The Imam Jama’at said very truly that no single party can be regarded responsible for the problems of the world. Indigenous community of Canada lives in their tribes. They often come to the cities. The community is called First Nation. One of them, Lee Prueshield says, “I loved it that the Imam Jama’at, displaying a great courage and honesty, contested the objections leveled against Islam that it teaches terrorism. I liked it very much that the Imam Jama’at proved through references from the scriptures (meaning the Quran) that those allegations are false.” Then, he says,” The way the Imam Jama’at told the western countries that they are providing arms to the Middle East is true. Describing the wisdom behind the Islamic wars, the Imam Jama’at uttered a sentence- “To stop hand of oppression”.” He says, “I liked that sentence and I will always remember it.” It meant that the Islamic wars were fought to stop the hand of oppression. He said, “Your Khalifa very well understands the meaning of oppression and terror. That is why I felt that Khalifa can recognize our agony very well.” They have different tribes and about ten of them came there. I met them also and we shall make tabligh programs there as well. God willing, avenues will open up. There has been media coverage through different news channels, TV and radio. Eight to ten Channels and newspapers including the national level newspapers, published the news. This way, through the interview and press conference, the message was received by 5 million people. During the Canadian visit, the media coverage included 32 TV channels that broadcast news in five languages and 40 million people received the message. Collectively, thirty pieces of news were broadcast on different radio stations in six languages. Eight million people received the message through them. A total of 227 newspapers published the news and interviews in 12 different languages and 4.8 million people received the message through them. 14.6 million people received the message through social media, the other media, electric media etc. Folks there have estimated that if all means are added up, more than 60 million people received the message. Glory be to God. It is the grace of God and we should value the grace of God and preserve it too. Particularly the Ahmadis of Canada should pay attention to this, so that the blessings of God increase. Always remember that we should have an intention of spreading the message of Ahmadiyyat and true Islam in all of our endeavors. There should be an intention of spreading the Unity of God. If this happens then God will also bless our work. May Allah the Exalted grant us the capacity to do it. Now, I say to the Ahmadis of Peace Village and the Abode of Peace Village, (99% or more of their population is Ahmadi) that they create an Ahmadi atmosphere there. They should try their utmost to be the ones who will establish a true model of Islam and the way you have shown the love and faithfulness with Khilafat, in my presence, you should be among those who will increase it and keep on excelling in it. Do not forget your real purpose that we have to create a relationship with God and we should never become indolent in His worship. May Allah grant them, you, and me the capacity for it. Ameen!